Palaeoecology: Ecosystems, Environments and Evolution. Very highly recommended, an excellent and comprehensive introduction to palaeoecology in all its facets. Many references for those who wish to explore the subject further. 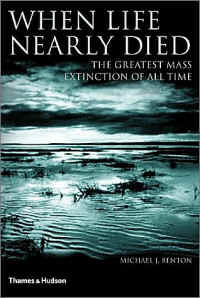 When Life Nearly Died: the Greatest Mass Extinction of all Time. Michael Benton's latest book is a semi-popular explanation of the end-Permian extinction. Over the last two decades, paleontologists have reached consensus that the end-Permian ("PT") event was the greatest biotic disaster of the Phanerozoic, and possibly of all time. It is hard to know how seriously to take figures of this sort, but Benton cites species extinction rates of 95% and more. Even this figure, he suggests, is conservative because it does not take into account additional pulses of extinction, including a slightly later Olenekian event. He describes the PT devastation as world-wide, non-selective, and so thorough that ten million years were required to recover to more or less normal levels of biodiversity. Explaining why and how the PT extinction happened is a difficult task, but Benton does it very well indeed. More than half of the book is history and background. Normally, this would be irritating, but Benton covers it so fluidly that one doesn't really mind. The heart of the PT problem is stratigraphy -- both the science of stratigraphy and the philosophical bias of the stratigraphic community. Benton has an almost unmatched ability to tell the science part of any paleontological tale in plain, straightforward prose. In this book, Benton shows us that he can also produce, at the same time, a well-structured story about the interaction between philosophy and science in the geological community, as well as the interplay between geologists, paleontologists, and others. In short, this is that rare book, a really balanced and compelling study of a scientific idea, including both its content and its history. Personally, I am perhaps even more impressed with Benton the historian than with Benton the writer or Benton the paleontologist. He never bogs down in personalities. He tries to understand both Victorian Englishmen and Soviet apparatchiks on their own terms and usually succeeds. True, he inserts the conventional reminder that the former were arrogant imperialists, and he does gloss over some uncomfortable truths about Soviet science -- all according to the latest academic fashion. However, Benton's writing is too clear and honest to allow even self-deceptions to cloud the facts. If there is any disappointment in the book, it is on the science side. However, this was intended to be a semi-popular book, and it would be churlish to expect too much. Benton concludes that the Siberian Traps were responsible for the PT extinction. If his marshalling of the evidence for this hypothesis is less than compelling, it is probably only because the evidence itself is still less than compelling. He is probably correct, but there are aspects of the PT event which are still very unclear. Unfortunately, most of these issues remain unresolved due to the same problems which have bedeviled the PT question from the very beginning -- the intractable issues of dating and stratigraphy around the PT boundary. We just don't know, not even to an order of magnitude, how long the die-off took. Our knowledge of the recovery phase is just as bad. Everyone agrees that the recovery took a long time. Certainly it took over a million years, but whether it was 1, 5, 10, or 20 My depends on what one's criteria are and on the uncertainties of Early Triassic stratigraphy. A few examples will suffice. The Induan Age, the first age of Triassic, has been shrinking. Not very long ago, it was supposed to have lasted about 5 My. Now, the best estimate is 1.3 My and possibly as little as 0.2 My. Obviously this makes a huge difference in how one views the initial post-PT world. Another problem is the supposed Late Olenekian extinction. Benton views it as a mass extinction. Others see it (as Benton is fair enough to state) as faunal turnover connected with recovery, much like a succession series in any ecological recovery (see our discussion at Olenekian). Which view is correct depends critically on what organisms were where and at what time. The issue simply cannot be resolved without a much finer parsing of the stratigraphic record. But enough of that sort of thing. The scientific issues are sometimes frustrating and difficult. The book, on the other hand, is simply a really good book. At the moment, its US$30 price is a bit steep for many of us; but, by all means, get it when you can. ATW040209. Postscript: very recent dating of the Siberian flood vulcanism places this series of events at about 251.3 Mya, with most locations dating between 251.7 and 251.1 Mya (all dates ±0.3 My), resulting in the extrusion of 2-4 million cubic kilometers of volcanic material. Kamo et al. 2003). This is extremely close to the currently accepted date for the end-Paleozoic of 251.0. Unfortunately, the Permo-Triassic boundary is placed about 1My after the main pulse of extinction. So we still have a small, but annoying gap, with the extinctions taking place slightly before Central Siberia turned into an incandescent mud bath. In addition, the figures sound large, but amount to no more than a single Krakatoa-size (20 km³ ejecta) event every 4 years, on the average. Maybe enough to threaten the existence of life, but maybe not. Once again, we just don't have the temporal resolution down fine enough to tell. If, for example, 100 Krakatoas, had exploded during even one of those 500-600 ky, we might well not be around today to discuss the matter today. The odds are that no more than 10-15 or so would have occurred in even the worst year, if the distribution were random. [Check my math: I make it 3,000,000 km³/ 20 km³ = 150,000 Krakatoa-equivalents. 150,000 Keq / 600,000 yr = 0.25 Keq/yr on the average. The chance of 10 in any given year is then (0.25)10 = 9.54 X 10-7. The chance of ten not happening at all in 600,000 years is (1 - 9.54 X 10-7)600,000 = 0.564] However this assumes that the rate of vulcanism was randomly distributed, which is a very, very bad assumption. Kamo, SL, GK Czamanske, Y Amelin, VA Fedorenko, DW Davis & VR Trofmov 2003), Rapid eruption of Siberian flood-volcanic rocks and evidence for coincidence with the Permian-Triassic boundary and mass extinction at 251 Ma. Earth & Planet. Sci. Lett. 214: 75-91. Gaining Ground is about the evolution of terrestriality in the tetrapods; not a topic about which a great deal is presently accessible to the layman. The book is written by someone currently active in the field, and so possesses the greatest possible authority and currency. Wow, what a transition! But this is not simply a case of picking up the pace: actually understanding much of the subsequent text requires one to have learned or at least remembered the names of) these bones from this whirlwind tour. I venture to suggest this material is simply too densely-written for a lay audience; I expect many a second-year vertebrate zoology student would struggle with it. Which brings us to my second point, really a generalisation of the first. The organisation of the book is not really conducive to learning. For one example, it is set out geochronologically rather than by smaller-scale evolutionary themes (more interesting for the layman, perhaps, but unhelpful to the struggling student). Another example, which particularly nagged me, is the inconsistent use of various taxonomic ranks. One minute we're talking about lysorophids, the next microsaurs, then lepospondyls. It was only once I took out a notebook and began sytematically tracking all these names down in the text that I discovered that a lysorophid is a kind of microsaur, which in turn is a kind of lepospondyl, except it might not be. It shouldn't require detective work to learn the sense of a textbook. Incidentally, I was prompted to undertake this exercise in order to compare the cladograms which fill the book from page 271 onwards, and are the worst example of this problem. Without your own "systematic index" these will be a complete mystery to even an advanced student, who, gazing at fig. 10.3 for example, is otherwise unlikely to realise that Paleothyris is included as a proxy for the Diapsida. One aspect that particularly impressed me and which, to be fair, may have been impossible to achieve with a different structure, was the breadth adopted at the beginning of several chapters, to place the "action" in a meaningful ecological context. These small vignettes paint a reasonable picture of the life and times of Acanthostega et al., and alone are worth the price of the book. Recommendation: Recommended, though with the provision mentioned above. Look and Feel: A good-quality hardback. Photographs are matt b&w, and the reproduction somewhat variable. The many line drawings are mostly very good. Oxford Univ. Press, 266 pp. This book is straight from the horses mouth, so to speak. Conway Morris was one of the original team involved in the massive effort of re-examining and re-interpreting the Burgess Shale collections from Walcotts Quarry and nearby. 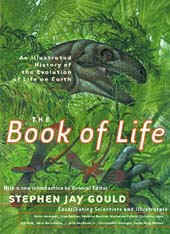 The book begins with a rather strange discussion about evolution  presumably motivated by a desire to bury the tosh that Stephen J. Gould tossed up in his book, Wonderful Life  before moving on to setting the scene; both in terms of the history of life (there is a page or two about the Ediacaran biota) and of the locality itself. Next the author describes some of the organisms in more detail, beginning with Hallucinigenia which he originally misinterpreted. The main taxonomic section of the book is organized into chapters corresponding to ecological, rather than phylogenetic groupings: mud-dwellers, mud-stickers, walkers and crawlers, and swimmers. The next chapters compare the Burgess Shale Lagerstätten with similar faunas elsewhere in the world, including the Sirius Passet locality which Conway Morris was instrumental in bringing to world attention. The author then essays a synthesis of these faunas and an interpretation their evolutionary significance. This provides him with another opportunity to debunk Gould and offer less dramatic explanations on the Cambrian "explosion," the genetic underpinning of evolution, animal architecture, and more. This book, as a whole, is rather idiosyncratic  though amusingly so  combining quirky metaphors with hard science. It is an easy read for anyone who knows a bit about geology and I would guess that anybody who had a mind to could get through it and understand everything. Look and Feel: Hardback; good quality paper with high resolution b&w photographs and some colour plates, extensive reading lists, and a good index, but by no means a text book. Other reviews: Book Review - Crucible of Creation- The Burgess Shale and the ...; OUP- Crucible of Creation- Conway Morris publisher's blurb); The Crucible of Creation- The Burgess Shale and the Rise of ... extended excerpt); Book Reviews- Morris extensive discussion); Jack's Stacks- January, 1999; The Eagle 1999 - Book reviews; The Crucible of Creation. He is taken to task for this criticism by Richard Fortey, in the latters book, Trilobite (see also London Review of Books). Fortey may have the right of it, but I think he has taken pop psychology just a tad too far and overlooked the obvious. I think its more likely that Conway Morris (and others) are simply pissed off with Goulds chest-thumping brand of self aggrandizement. And who wouldnt be? Gould takes a self-evident proposition  that Cambrian animals were a diverse and unfamiliar lot  and over-blows it into yet another one of his grandiose pattern of nature theories. And, of course, only our Stephen is clever enough to have realized the real significance of the work Whittington, Conway Morris and Briggs have been slaving over for years. Not only that, he makes his pitch direct to the public in a popular book. 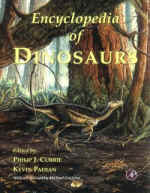 A landmark book, collecting together a huge range of information about dinosaurs which would ordinarily only be available to those with access to a professional research library. The writing is generally dispassionate, the information generally balanced and well-presented. Recommendation: Recommended, but don't make it your only reference. Look and Feel: Good quality hardback. Photographs and good diagrams are plentiful. The few coloured plates could have been put to better use than reproducing various artists' impressions of what dinosaurs may have looked like. The Simon and Schuster Encyclopedia of Dinosaurs and Prehistoric Creatures : A Visual Who's Who of Prehistoric Life. This is a very good non-technical introduction to prehistoric vertebrates. 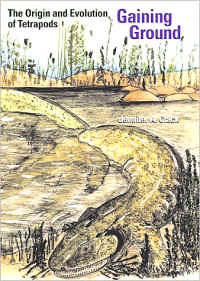 Although there is a brief coverage of basic background topics - how fossils form, continental drift, etc - by the far the most interesting, and indeed the bulk, of the book is the coverage it gives to a large number of individual genera (more than 600 altogether, from primitive fish to Pleistocene mammals), each of which is illustrated by a specially commissioned full-colour painting. It is the sheer number and diversity of creatures covered here, that makes this book so interesting. (But even that diversity is just a tiny fraction of all the types of prehistoric creatures that are known to science). The realism of the art work tends to vary - some drawings seem to me more realistic than others, but I suppose that's just personal taste. The art work is still of good quality throughout though, and often represents the only life-reconstructions available for creatures otherwise shown only as drawings of skeletons in palaeontological textbooks. Obviously, the colour schemes are speculative, since it is not known what these animals really looked like. The accompanying text is brief and non-technical but still clear and informative, and gives a basic introduction to that type of animal. The best thing about this book is that it's not just about dinosaurs (although these are covered in detail) but also deals with many other types of vertebrate creatures as well. My only real criticism is that despite the title - "animals" - no invertebrate animals were included, no trilobites, eurypterids, nautiloids etc. Still, you can only cover so much in the space available, and this book does a pretty good job. The Evolution of Terrestrial Ecosystems Consortium. (1992). Terrestrial Ecosystems Through Time: Evolutionary Paleoecology of Terrestrial Plants and Animals. Edited by Anna K. Behrensmeyer, John D. Damuth, William A. DiMichele, Richard Potts, Hans-Dieter Sues, and Scott L. Wing. The University of Chicago Press, Chicago and London, 568 pp. HarperCollins, 269 pp. ISBN 0-00-257012-2, 0375406255? When I read the introduction to one of Forteys earlier books, Hidden Landscape, I immediately realized that here was someone who truly understands how it feels to hammer open a rock and discover some treasure within. However, the introductory chapter of Trilobite!, which involves an over-extended parable about some Thomas Hardy character, exceeded some kind of threshold in my mind and became, simply, florid. Fortunately, the introduction is soon over and we jump into some very lightly technical details about the beasts themselves: a field in which Fortey is, justly, considered pre-eminent. The widest part of the animal is at the head end where there are prominent spines at either corner, behind which the body tapers gradually backwards along a thorax comprising many, rather flat segments with prominently spiny tips. uncertain (p. 79). Well, I think thats just bunk and Fortey should stick to trilobites. There is zero likelihood of a world ruled by, say, smell because  moths notwithstanding  it just isnt a very useful sense. I could go on about the relationship between wavelength and resolution, but the reader would be better served by Richard Feynman; try The Character of Physical Law for an excellent starter. (Hint: The wavelength of some aromatic molecule with an atomic weight in the bazillions, wafting around in the atmosphere, is not small.) Fortunately one has to endure only a page of this crap before the author is back among the fields he knows  Hox genes, in this particular instance.  and includes his now, surely, infamous denunciation of Simon Conway Morris (read more). Disappointingly, there is only a passing reference to the Ediacaran biota, which struck me as rather strange since Id expect this topic to be of acute relevance to any discussion on the origins of metazoans. The second half of the book, which I will skip over much more briefly, provides a quirky though fascinating insight into some of the actual daily work of a researcher like Fortey; an anthropic but useful discussion of stratigraphy and, unusually in a book like this, extinction. This is followed up by a rare and interesting look at the difficulties of paleogeography in a chapter called Possible Worlds. Finally, oddly cheek-by-jowl in the penultimate chapter, we are treated to a discussion of ontogeny  how little trilobites grew up into big trilobites  and a chronologically arranged review of trilobite evolution. On balance, I have to admit to some disappointment though. Having read 250-odd pages, ostensibly all about trilobites, by one of the world's foremost authorities on the subject, I feel no better equipped to tackle the professional literature (e.g. the updated Treatise) than when I started. I guess I just didn't learn as much as I'd have expected to. Recommendation: Eccentric, but highly readable. Look and Feel: Hardback; good quality paper with high resolution b&w photographs on the pages and some b&w plates; indexed. Authoritative, and with the weight and feel of a good text book, but by no means written like one. 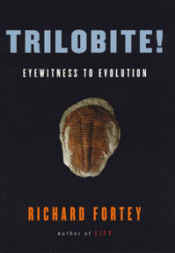 Links: Trilobite- Eyewitness to Evolution by Richard Fortey Sam Gon); Trilobite by Fortey, RA, FORTEY, RICHARD; Jack's Stack- April 2001; Rocks & Minerals- Trilobite! Eyewitness to Evolution (book review ...; Sharp Blue- Trilobite! ; Trilobite Eyewitness to Evolution. The Book of Life: An Illustrated History of the Evolution of Life on Earth, 2nd ed. Excellent introductory coverage of the evolution of life on Earth. Unfortunately little emphasis given to invertebrates in the later chapters (a fact Gould himself points out in his extended and very readable preface). Contributed articles by Peter Andrews, John Barber, and Michael Benton. Illustrated by Jean-Paul Tibbles. This book has not done as well as it might have, and bookstores have deeply discounted the price. Currently (12/03), it's a steal, but may become unavailable in the near future. Links: Book of Life (hardcover) the publisher's description); Book of Life a moderately favorable review from Prof. Phil Adds); A mini book review The Book of Life Stephen Jay Gould, General ... another favorable review); The Secular Web - infidels.org two reviews, one with the usual carping about Gould's personality).